Moonshine Wash slot canyon is tucked away in the middle of the San Rafael desert, and is now one of my favorite non-technical slot canyons in Utah. 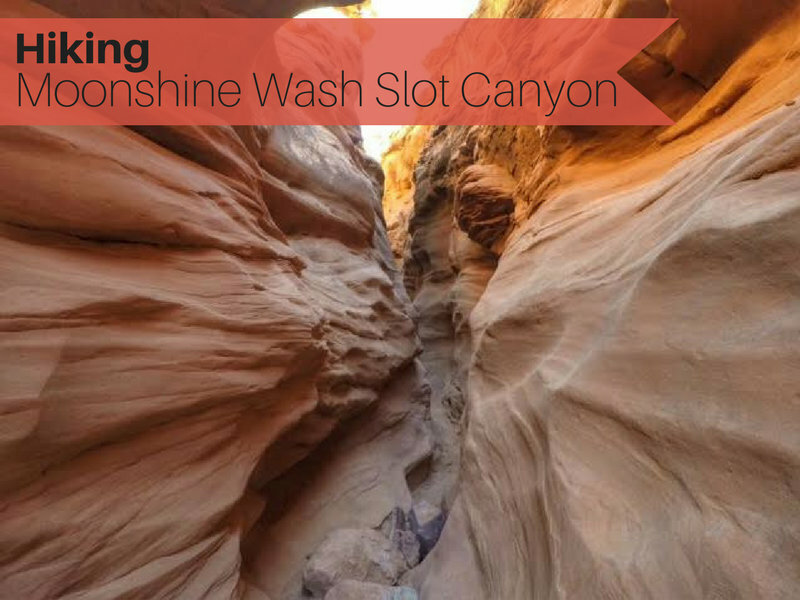 The best section of the Moonshine Wash slot canyon lasts for about 1.5 miles, and at every nook and cranny the lighting can look very different and vibrant. There are a few chock stones creating a fun obstacle for hikers, where you have to use a down climbing technique called stemming (also chimneying). 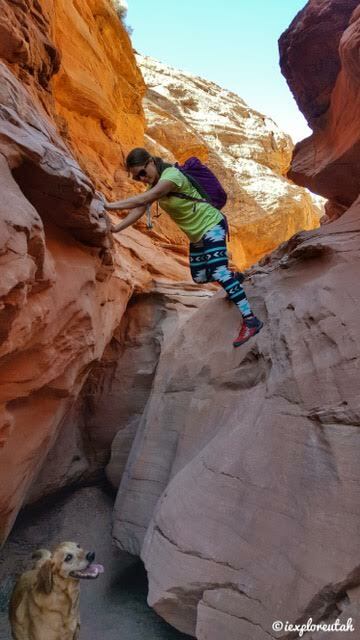 Both techniques require you to push your weight up against the slot canyon walls to help maneuver down drops more than 6 ft. 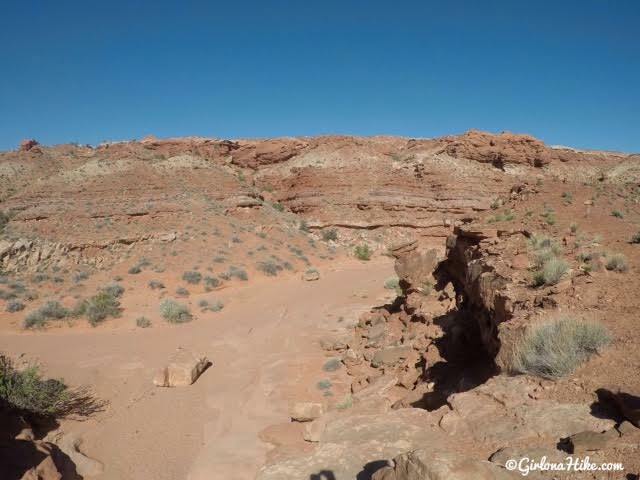 The geology in Moonshine Wash is quite fascinating as well - the upper parts have smooth walls made of thin, gently sloping strata which give way to more angular layers with knobby areas, all in various colors of red, orange, yellow, and some darker areas as you get deeper into the canyon. This wash also contains an abundance of history from the 1900s. The canyon was named after the then illegal whiskey that was located in the canyon during prohibition. A signature landmark of Moonshine Wash is the old sheep bridge spanning the tightest spot of the slot canyon, at a mere 3 ft wide. 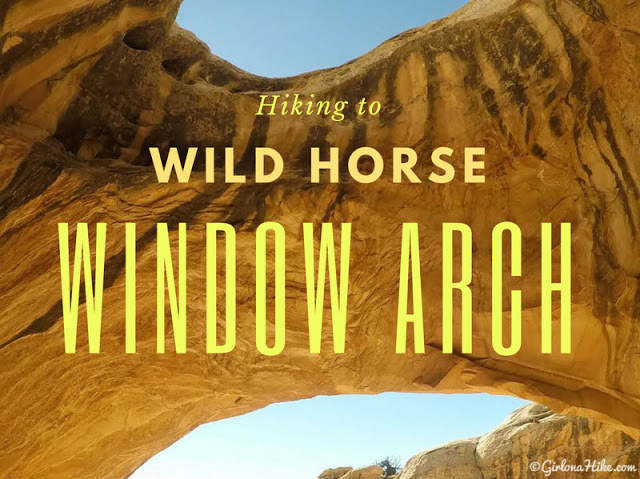 If you want to learn about more history in the San Rafael Swell & desert, get this book or this book. 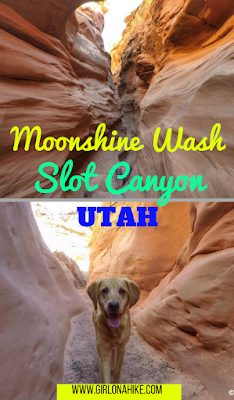 Dogs are allowed off leash in Moonshine Wash Slot Canyon, however a little discretion is advised. 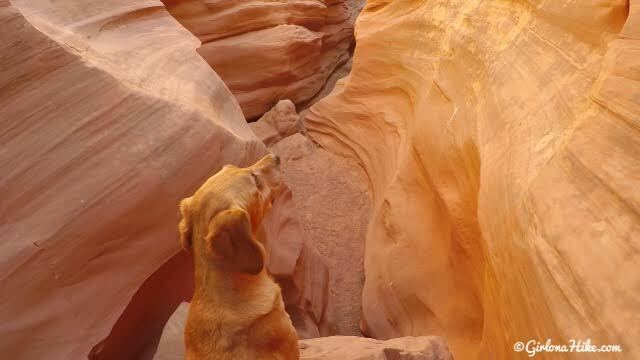 There are several chock stones ranging from 1-9 ft drops that may require a dog harness to help lower them. 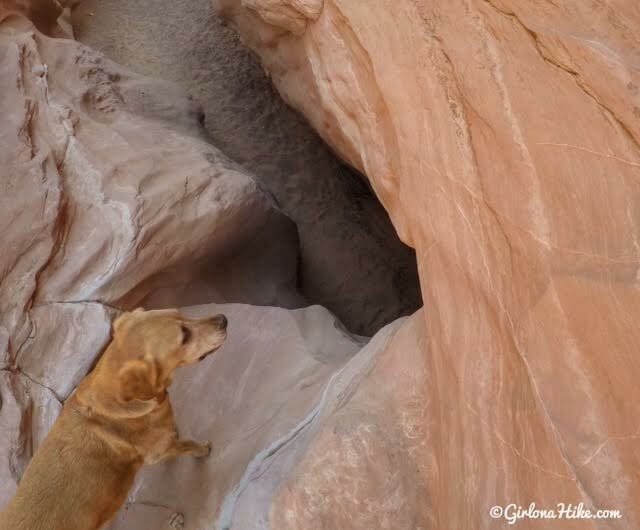 Not all dogs enjoy or feel comfortable in slot canyons. 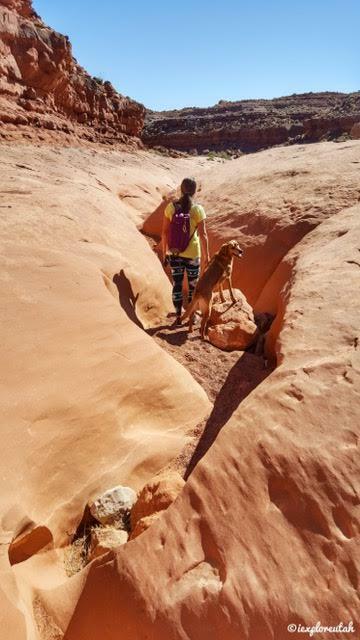 When sliding a dog down the chock stones to a friend below you, the chock stones' slickrock can easily tear up paws so dog booties might be helpful for dogs with sensitive paws. 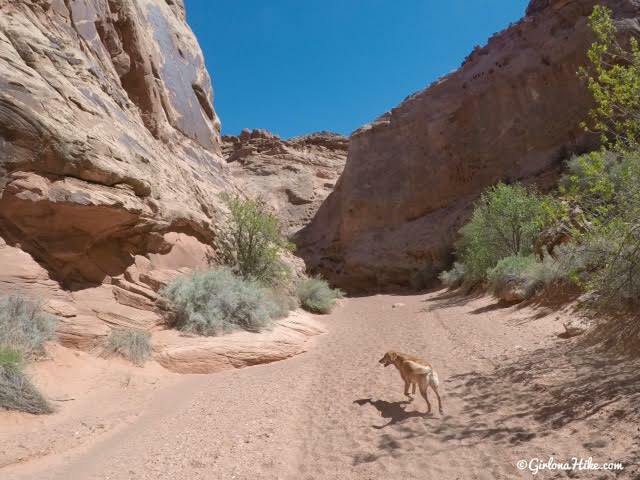 Dogs over 80 lbs will have trouble fitting through the canyon, and of course, the heavier the dog the harder it will be to lower them. 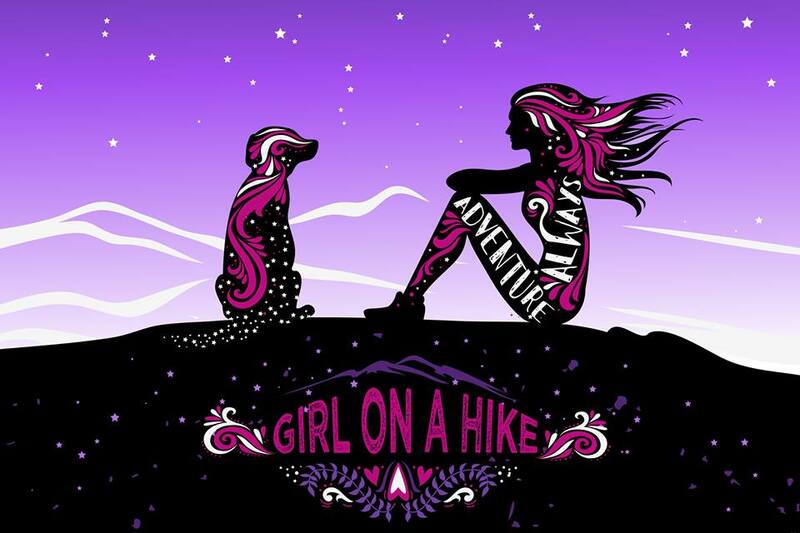 You do not want to attempt this hike with your dog alone - there's no way to safely lower them alone, unless you have experience with rappelling and have appropriate gear to do so. We didn't bring the dog harness, and I wished I had! 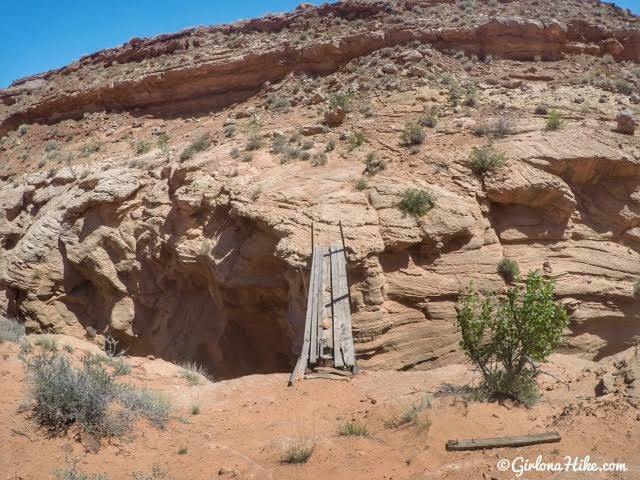 As mentioned before, hikers do not need equipment to stem down the canyon. 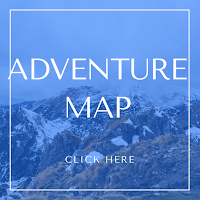 If driving from SLC, use this map. 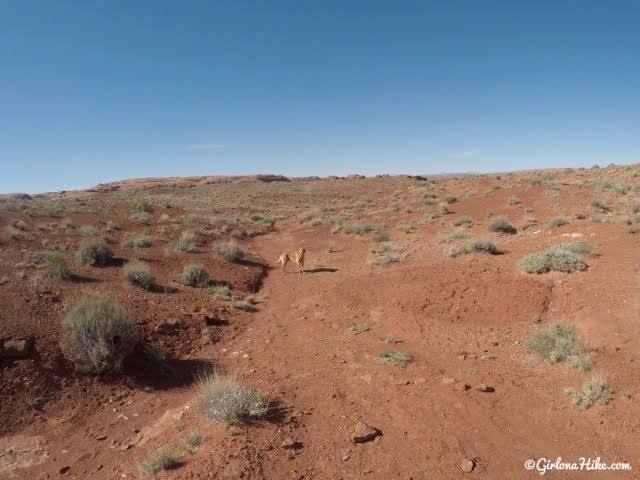 Google Maps rarely understands how to drive down dirt roads, so once you get to the very end of this route I've marked, turn right (East) down the dirt road for 1 mile. The road will go down a really steep, rough road, then back up. You definitely need a 4x4 car here. 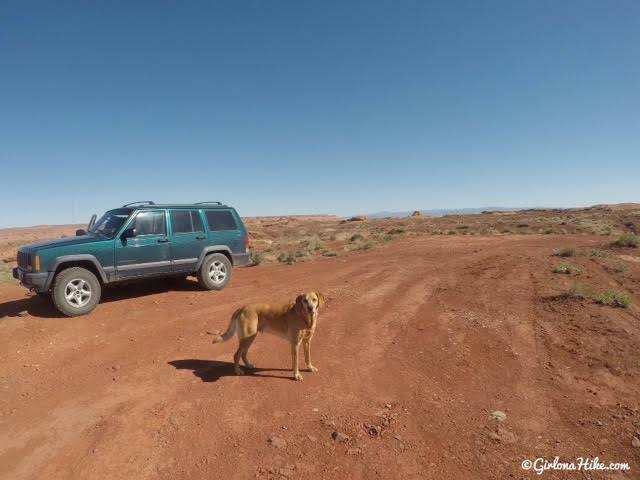 We drove a Jeep Cherokee and had to put it in 4-wheel drive. Mini SUVs (RAV4, CR-Vs, etc) won't make it. Don't attempt to drive here during or right after a rainstorm - the road turns into a mud pit. The closest town to get a tow is Green River, which is still about an hour away. Kid friendly? Maybe. Depends on age and experience. Nothing special marks the trailhead, but the road does end in a turn around. 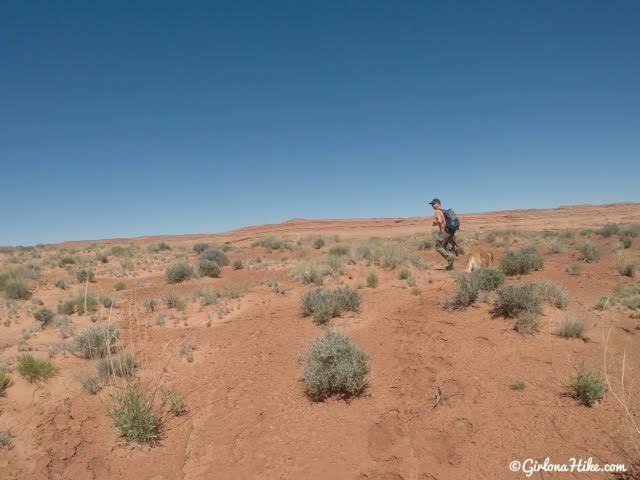 The trail starts in the wash you see to the Southern area of the parking spot. You will likely see lots of footprints heading that way as well. Just follow the wash until it turns West and you reach this drop off. 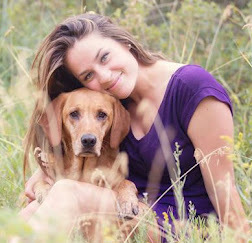 It's easy to scramble down (dogs don't need help yet), then follow the wash North. There are cairns down there. 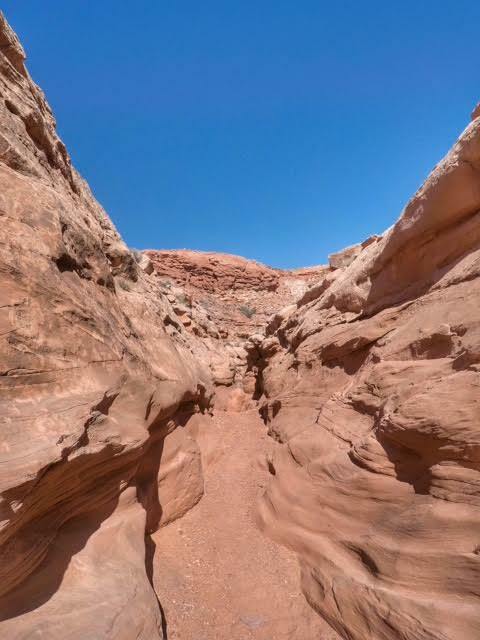 As soon as you see the slot canyon start to form, hop right in and follow the canyon for the next 2 miles. 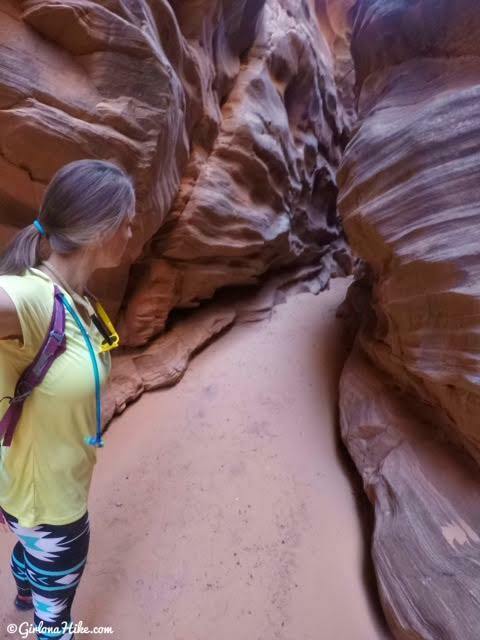 The walls get higher as you continue down the slot canyon. The first of many drops. Charlie was able to do most of them himself. 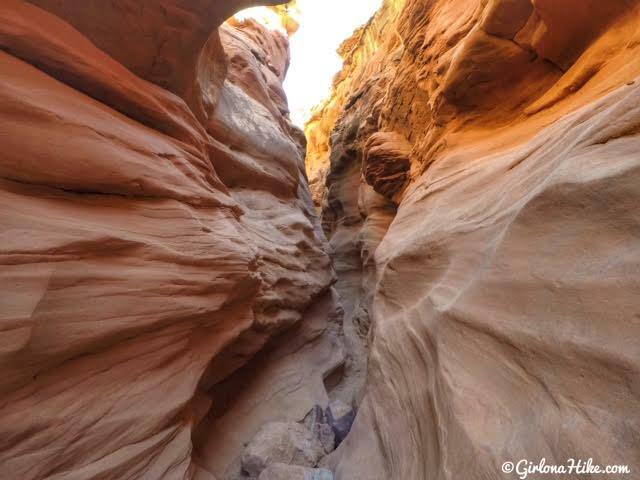 Every times we turned a corner, the slot canyon got even narrower and cooler looking! I recommend wearing pants in Moonshine Wash. 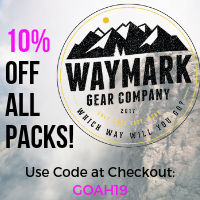 They will help protect your legs when you brush up against the canyon walls and when you slide and stem down a chock stone. I am in love with the Aztec pattern right now, so when I found these leggings on Amazon for $12 it was a done deal. I won't pay over $15 for leggings....maybe $20 if they are really cute. They have some really cute patterns, and the material is really soft and stretchy. It's a one-size fits all, and they really do fit. Surveying the next drop. 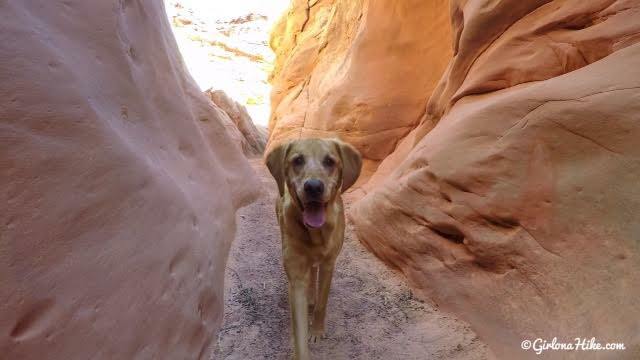 As we got further down canyon, Charlie needed help to get down the chock stones. He started to cry and bark on two of the drops, especially on the 9 foot drop. We didn't bring his harness (didn't think we needed it based on trail research), so in order to get him down my friend would stem down first, then I would lower charlie face first by his hips while my friend caught him by his scruff and legs. It was definitely not the most enjoyable part of the hike, and twice I wasn't sure Charlie was going to let me lower him. Thankfully he trusts his mama, and once I lowered him on the first drop he knew what was happening on the 2nd biggest drop. There's no way I could have lowered him myself if I hiked it alone - we would have had to turn around. 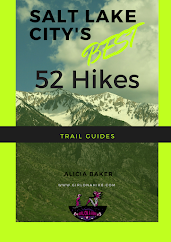 This is why I suggest you hike this with a friend and with a dog harness! Stemming down one of the smaller drops. This one was probably 6-7 ft. Eventually you should see the old sheep bridge high above you. From here you have to hike about 1 more mile until you can climb out of the canyon. Moonshine Wash opens up and follows the dry wash. It got pretty hot here with no wind. You definitely want to bring sunblock and at least 3 liters of water! I got a good sunburn on my face and chest and it was only 60F! 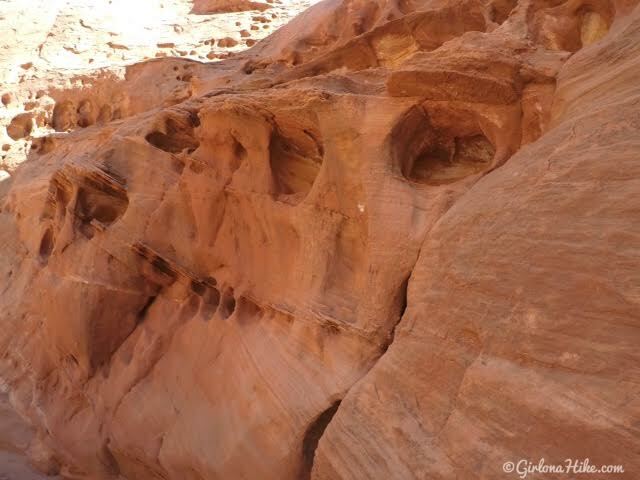 Interesting rock pockets reminiscent of Crack & Chute Canyon near Goblin Valley. Keep an eye out for this mini landmark - a medium sized hole on the left (West) side of the canyon. You should see a few really small cairns. This is the easiest place to climb out of Moonshine Wash. If you reach a "T" in the wash, you missed it. Looking back down to where we just climbed out of Moonshine Wash. It looks steep but it's not bad. Once you climb out, it's up to you to do some route finding and head back to the main part of Moonshine Wash that you first climbed down. There are old footprints everywhere, but don't count on those to lead you back to the car. There aren't any cairns either. 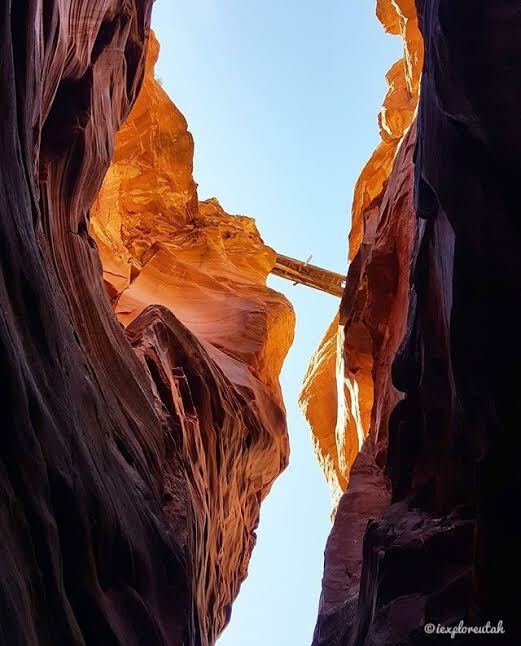 As long as you stay close to the rim above the slot canyon you should be fine. We really wanted to see the old sheep bridge from the top, so we stopped there on the way back. On my map my gps shows that I crossed the bridge - I did NOT cross the bridge. It's way too sketchy to cross. 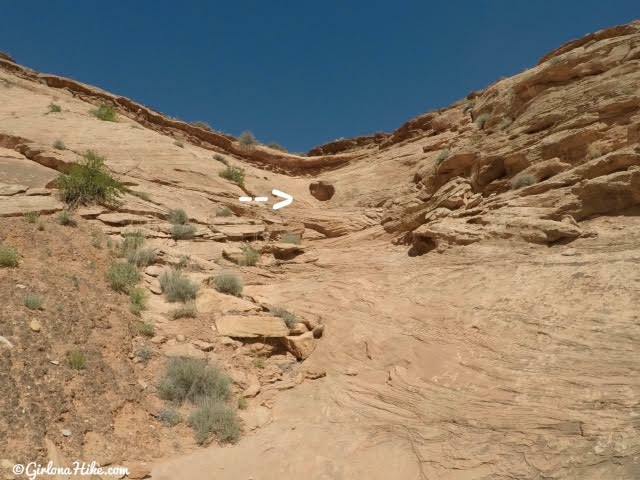 I think the gps sometimes gets things wrong in slot canyons because it can't correctly locate your position. You'll also see on my route that we got cliffed out a few times and had to backtrack. What an awesome slot!! Glad Charlie made it all right:) I imagine it was pretty scary for him on the steeper drops. Pretty cool to see that old sheep bridge still up there. I remember seeing that in another trip report a few years ago back on another forum and thinking that was pretty cool. Looks like a cool slot, I'll have to check it out sometime. Hi. Thank you for your trip report! 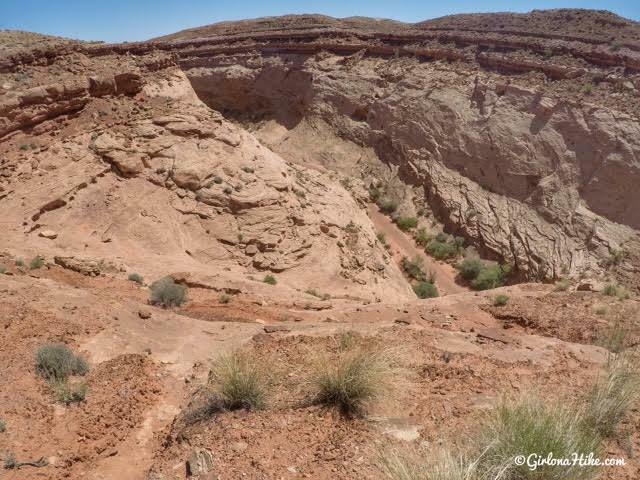 I'm looking at doing this canyon this weekend. Would you be able to export and share your .gpx track with me? I'm not seeing where I can email or PM you.